For each species group, the animals’ status in Scotland, vulnerability to different kinds of disturbance, signs of stress or agitation, and sensitive times and places are discussed. Our main concern is to minimise disturbance on individual encounters with wildlife. But, inevitably, there will be times when there are so many encounters that animals’ well-being, and even survival, could be compromised. To find out what you can do in these situations, read the section on dealing with cumulative impacts. What’s more, several annexes provide advice and contact details for recording your sightings and reporting injured animals, as well as details of more specialist codes concerning particular areas, users and species. 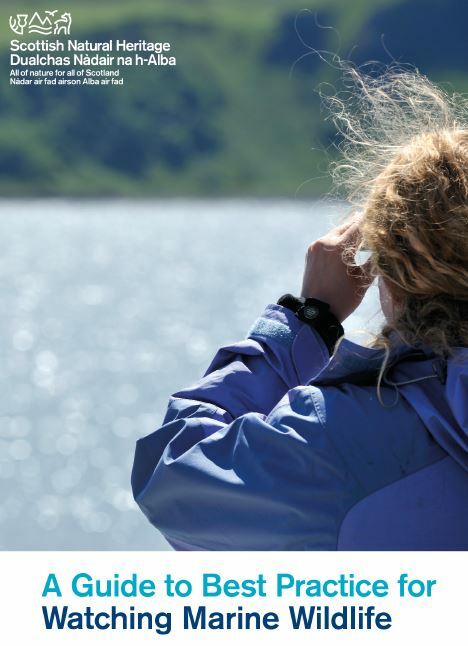 This concise code of conduct sets out best practice on watching marine wildlife whether you’re on the coast, on the sea or in the sea. To avoid disturbance or harm to marine wildlife, you should follow the Scottish Marine Wildlife Watching Code whether you’re watching from the shore or at sea.